, lord Berners, was born about 1467, son and heir of sir Humphrey Bourchier by Elizabeth, daughter and heir of sir Frederick Tilney (widow of sir Thomas Howard), which Humphrey was killed at Barnet-field, on Edward IVth’s part, and buried in Westminster abbey, during the life of his father, who was sir John Bourchier, K. G. fourth son of William earl of Ewe, and baron Berners, by marriage with Margery, daughter and heir of Richard lord Berners. 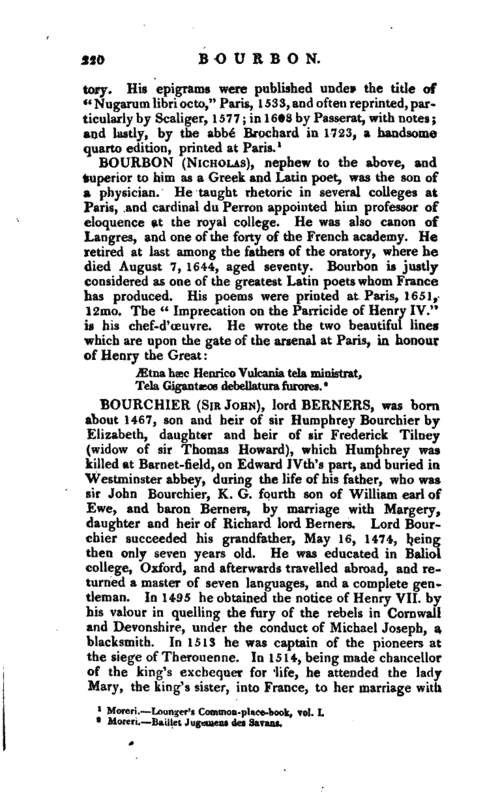 Lord Bourchier succeeded his grandfather, May 16, 1474, being then only seven years old. He was educated in Baliol college, Oxford, and afterwards travelled abroad, and returned a master of seven languages, and a complete gentleman. In 1405 he obtained the notice of Henry VII. by his valour in quelling the fury of the rebels in Cornwall and Devonshire, under the conduct of Michael Joseph, a blacksmith. In 1513 he was captain of the pioneers at the siege of Therouenne. In 1514, being made chancellor of the king’s exchequer for life, he attended the lady Mary, the king’s sister, into France, to her marriage with | king Lewis XII. and in 1527 obtained i grant from the king of several manors. Afterwards he vas made lieutenant of Calais and the marches adjoining to France, and spending most of his time there, wrot< several learned works in that situation. 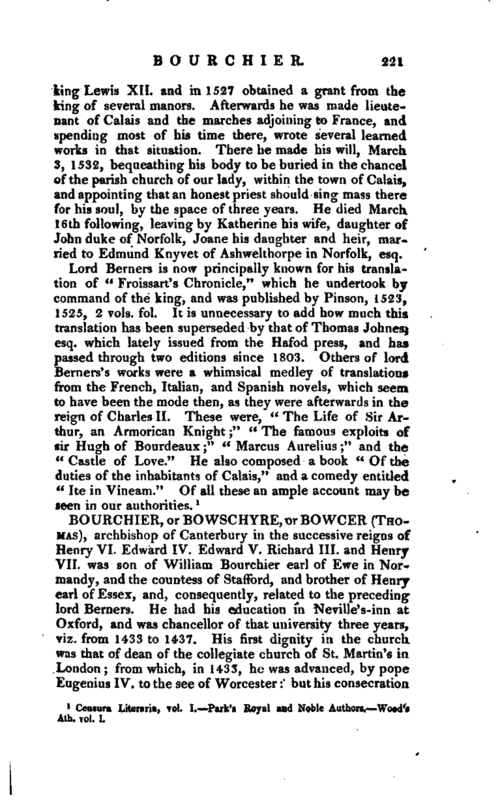 There he made his will, March 3, 1532, bequeathing his body to be bur’ud in the chancel of the parish church of our lady, within the town of Calais, and appointing that an honest priest shouldsing mass there for his soul, by the space of three years, ie died March 16th following, leaving by Katherine his wie, daughter of John duke of Norfolk, Joane his daughter nd heir, married to Edmund Knyvet of Ashwelthorpe inNorfolk, esq. Censura Literaria, vol. I.—Park’s Royal and Noble Authors.—Wood’s Ath. vol. I.